Gwynedd’s connections with slate stand out on the roofs of our houses. Natural and durable, a slate roof can last a lifetime. But over time timbers rot, nails fail and storms loosen and remove slates allowing water penetration, which can cause serious damage to the fabric of the building. Slate being a natural material varies in type and thickness. It takes real skill, developed over the years to select the correct slates, position and fix them correctly. Repairing a slate roof requires those same skills, having a feeling for the material. We undertake all roof repairs from minor jobs like re-fixing a loose slate to full replacement. We can also repair a tiled roof. 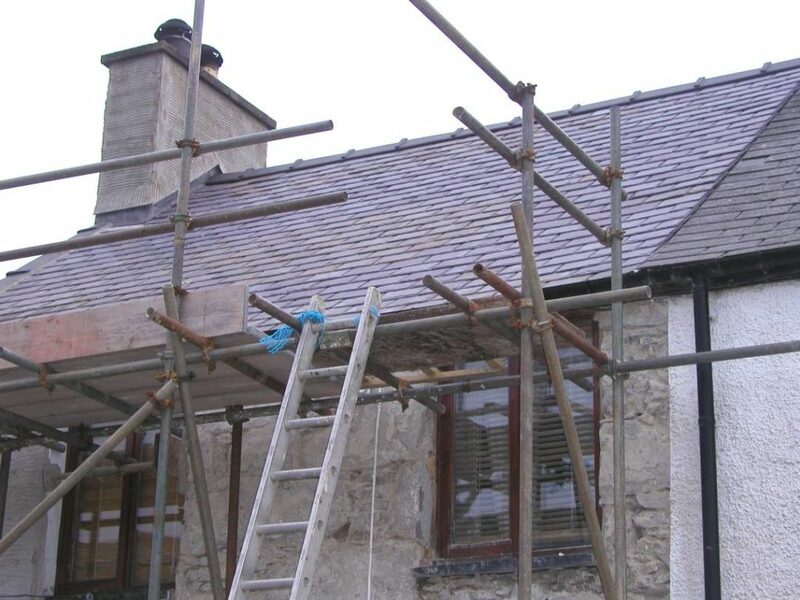 We can replace missing or damaged slates, renew flashings around chimneys – re-rendering if necessary. As with all property maintenance, prompt action when required will save more expense later. Where a roof has not been properly maintained – not uncommon – and multiple slates are slipped or damaged, the best option may be to completely strip the existing roof slates and re-slate the roof. At the same time checking and repairing or replacing any of the supporting timbers. The final option is to completely replace the roof, replacing and reconstructing the timber sub-structure, re-felting and then re-slating. We can survey your roof and advise you as to the best options: roof repair, roof renovation or roof replacement.